Familiarize yourself with all the different styles of jewely featuring earrings, bracelets, rings, necklaces and more. Hoops: This elegant and versatile earring comes in oval or round shape tubes usually made from precious metal. To add flash and elegance to these types of earrings, they can be set with diamonds or other gemstones. Hoop earrings range in size from closing at the bottom of the earlobe to falling all the way down to the shoulder. The history of hoop earrings traces back to 2000 B.C when they were first discovered in ancient Greece. They are great ways of showing your love to someone for a birthday, anniversary or any special occasion. Most of our hoop earrings at Lauren B Jewelry are fashioned with diamonds, however we have different varieties including one with dangling emeralds as shown on the right. Huggies: These variations on hoop earrings differentiate themselves in their increased thickness as well as how they fit snuggly around the ear lobes. Because of its thickness and close fit, these earrings appear to be hugging the ear; hence the name huggies. Even though they are smaller in stature than regular hoop earrings, they are still highly visible on the ear because of their width. Dangle or Chandelier: These jewels are meant to flow from the ears to create an exciting, vibrant look. Dangle earrings are classified as one suspended column of gemstones set in gold, while chandeliers are distinguished by a fuller look of several strands of jewels that hang freely. At Lauren B Jewelry New York store, we have many dangle and chandelier earrings to choose from in different designs, colors, and gemstones. Longer chandelier earrings are also referred to as shoulder dusters. Studs: These are the smallest, and arguably most elegant, of all the earring styles. Stud earrings come in a variety of gemstones and pearls, with diamonds being the most enduring look. These matching gemstones are set in gold or platinum and are seamlessly connected to the earlobe through a post and push or screw back. The price of this jewelry is mainly determined by the size and quality of the gemstone. These stones are usually set in either a classic four prong setting or in a three-prong “martini” style that will create more for the gemstones allowing them to sit higher off the ear. At Lauren B Jewelry, we carry a complete assortment of square and round cut diamond studs in many different settings available here online. You can visit our New York store and at your request we can show you virtually any shape, color and clarity diamonds studs that you desire. Clusters: The cluster earring is an alternative to a simple pair of stud earrings. These on the lobe earrings contain a grouping of precious stones or pearls set in a bunch to form a distinctive unified look. The beauty of these jewels is reliant upon a pleasing grouping of stones, colors and shapes to form a glowing contrast earring design. Our cluster earrings come in all types of gemstones and color combinations ranging from the clean-cut diamond groupings to the more sophisticated precious and semi-precious combinations. For the diamond clusters, these are very cost effective in that they will give you the illusion of one larger center-stone, at a fraction of the price. Fashion or Cocktail Rings: This type of ring is meant to give a bold and striking impression, adding sparkle and glamour to your personal style. Cocktail rings, as they are commonly referred to, derived their name during the middle of the 20th century when cocktail parties were gaining popularity during the Prohibition Era. Because of its large size and diversification, these rings have become a staple in the world of fashion and jewelry. Also referred to as fashion rings, this jewelry piece is commonly worn on any finger but the left ring finger- which is reserved for the engagement ring. The right-hand ring finger is the customary position for a fashion ring. These types of rings come in many shapes and sizes, fashioned with any variety and combination of diamonds, precious stones, semi-precious stones and pearls. From something as simple as a coral 18k gold ring to the more ornate multi-color diamond and sapphire stacking rings you will be able to find the ideal ring for any occasion in our New York store. Engagement Rings: Just like any other piece of jewelry, engagement rings come in many different designs. The basic concept is a large center diamond set in a gold or platinum mounting. Diamonds come in all shapes and sizes as well, and depending on your preferences and budget, it is up to you to decide what type of center diamond you desire. Each shape whether it be round brilliant, princess cut, emerald cut to name a few, has its own unique characteristics that make it desirable. Here are some basic engagement ring styles to consider and keep in mind they can be combined with one another for a more sophisticated look. For example, some settings may have a halo design with a channel set band. Or for instance, a three-stone engagement ring can have a pave diamond band. • SOLITAIRE ENGAGEMENT RINGS This timeless and elegant style is typified by a single center diamond in a plain gold or platinum mounting. This does not necessarily mean this ring should look dull as there are many choices to make such as the metal type, width of the band, and the number of prongs or type of bezel holding the diamond in place. • PAVE ENGAGEMENT RINGS These rings are characterized by delicately crafted diamond encrusted bands, usually three-quarters of the way around, that serve as beautiful accents to the center diamond. 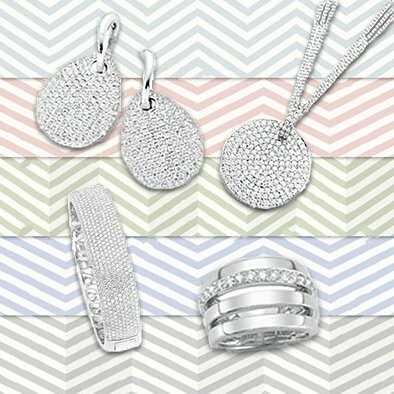 Pave, from the French word meaning pavement, refers to smaller diamonds set together in a fashion that completely hides any metal around it. This is also available in a micro-pave design for a more brilliant, finer look. 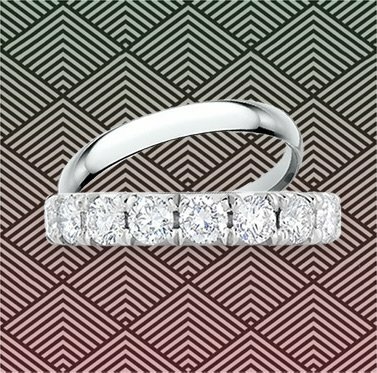 Note that the color and clarity of these pave diamonds should be consistent with the center diamond for a seamless look. • HALO ENGAGEMENT RINGS This beautiful design consists of a diamond encrusted metal circle surrounding the larger center diamond. The visual effect of the halo engagement ring is stunning because it gives the appearance of a larger center diamond. As with any other type of engagement ring, the halo and band designs come in many different styles. Here is just one of our halo engagement ring styles. • THREE STONE ENGAGEMENT RINGS These engagement rings are distinguished by the matching diamonds on each side of the center diamond. These side stones come in any shape with the most popular being round brilliants, tapered baguettes and princess cuts. As with any setting, these diamond accents should match the quality and color of the center stone. This round diamond and tapered baguettes engagement ring is sold by Lauren B Jewelry. • CHANNEL SET ENGAGEMENT RINGS The diamonds in these settings are inlaid into the bands of the ring without any prongs to hold them in place exactly as they are in this channel set round diamond center stone engagement ring. The manner in which these diamonds are set, generally makes for a sturdier more secure ring. • GEMSTONE ENGAGEMENT RINGS These colorful rings are typically characterized by a diamond center stone flanked by matching sapphires, rubies or emeralds (or vice versa). The contrasting colors afforded by this engagement ring style is perfect for a more distinct appearance. At Lauren B Jewelry, this emerald with diamond side stones engagement ring and this sapphire and pave diamond ring are just two of the many colored gemstone engagement rings in our collection. Wedding and Eternity Bands: Dating back to the times of ancient Rome when they wore iron bands around there fingers to make their marriage public, these rings commemorate one of the most important days in any person’s life. In addition to being a symbol of marriage and love, this ring has become a fashion accessory, that is customarily worn every day. For this reason, selecting a wedding band that you will love and cherish is of the utmost importance. Finding the proper fit for your bracelet jewelry is very important. While certain bracelets look best in a close fit, others attract more beauty in a looser, dangling style. To obtain the right size, measure your wrist and add about a ½ inch to 1 inch depending on what type of fit goes best with your particular bracelet. Most bracelets carried by Lauren B Jewelry are size 7.5 inches to 8.5 inches. In many cases, additional links can be added or removed to get the exact fit you desire. The clasp of a bracelet is another important feature to consider in a bracelet. Each type of closure is carefully crafted to compliment the overall design of the bracelet and is something that should be taken into consideration. The most popular types are: lobster clasps, doorknocker clasps, fold-over clasps, toggle clasp, bracelet types, bangle bracelets. Bangle Bracelets: This style is characterized by a circular rigid design that is worn by either slipping over the hand or through a hinged opening in the back. Bangles are timeless and can be worn as single piece of jewelry or in a group for a more sophisticated look. Lauren B Jewelry has a large collection of bangle bracelet jewelry ranging in styles from plain gold circular styles to the more elaborately shaped motifs decorated with various gemstones. Link Bracelets: These bracelets are made from connecting various or similar metals to form a chain design. Our most popular styles are gold link bracelets, either plain or set with diamonds and different gemstones. Lauren B Jewelry prides themselves on offering you a wide array of styles, from the simple yellow gold variety to more elaborate diamond, sapphire, and amethyst bracelet. Tennis Bracelets: This jewelry piece received its name from an incident that occurred during a 1987 tennis match during which Chris Evert was wearing an expensive fully set diamond bracelet which snapped off during the match. She requested the match be stopped so that she can find it, and to this day bracelets featuring a full row of individually set diamonds are referred to as tennis bracelets. Tennis bracelets are known for their luster and sparkle formed by individually set diamonds. The manner in which these bracelets are set allows for sparkle at any angle and a free-flowing movement, making for a very comfortable fit. Lauren B Jewelry carries an extensive collection of fine quality diamond tennis bracelets in different carat weights and styles; the most popular of which being round diamonds of the same size in either a three, or four prong, 18k white gold setting. If you do not see something that fits your preference, we can work toward finding the exact tennis bracelet for you. Cuff Bracelets: These stiff, relatively wide bracelets are comparable to bangles, but differ in that they have an opening in the back for you to slip on and off your wrist. Cuff bracelets can be made from different material such as gold, Bakelite, ebony, or string ray and decorated with different combinations of gemstones and diamonds- to make a bold yet elegant fashion statement. At Lauren B Jewelry, you are sure to find a cuff bracelet that suits your taste- from the simple and chic yellow gold cuff (above left) to the more sophisticated diamond, emerald, ruby and sapphire bracelet (right). Necklaces are usually classified according to size and style as listed below. Choker Necklace: 14-16”: These neck hugging necklaces are a beautiful compliment to a long neck because of the emphasis it places on the neckline. They also go well with a low cut or strapless wedding gown because it conceals a large portion of the neck area. This type of necklace usually comes equipped with an adjustment clasp to allow for more room. Different colored gemstones and pearls look great in choker necklaces, which was popularized during the lavish era of the Roaring Twenties and is once again back in fashion pages worldwide. Princess: 17-19”: This is the most popular necklace length, hanging just over the collarbone. If you’re not sure what length is most suitable this is the safest and most classic way to go. A pendant is a beautiful accessory to a princess length necklace. You can dress it up or go casual with a pair of jeans and a t-shirt. Lauren B Jewelry of New York we carry a wide selection of princess length necklaces. Matinee: 20-24”: This can be a very sophisticated look often used with casual or business attire to compliment a professional look. Opera: 28-34”: When worn as one strand it is ideal for high or crew necklines and can be doubled over to serve as a two-strand choker. The versatility of the opera length makes it an eye-catching option. It can also be knotted to create a stylistic retro look. Multi strands of opera length pearls were a favorite of Coco Chanel. Rope: 35-45” and Lariat: Over 45”: The luxurious extra-long rope and lariats necklaces exude a very chic and elegant look. Rope necklaces can be worn as double or triple strands depending on your mood. Lariats are another style of long-length necklace. It is generally unattached at one end so that you can clasp them in various ways to deliver a more refined appearance. Because of its length, it may be tried in a knot for an attractive contemporary look. Layered Necklaces: This type of jewelry piece is made up of several strands of beads or chains. These necklaces come in many different shapes and designs. Some have all their strands attached to the end of the same clasp while others are made up of separate necklaces mixed and matched together. The most common layered look consists of three strands; however it is not unusual to see people wearing up to ten strands for the fullest of layered looks. Layered necklaces can be formed from a large variety of materials including beads or chains fashioned with different types of gemstones including diamonds. Each layer can be the same or to add contrast and style, different materials and colors can be used on alternating strands. Multi-strand necklaces have recently become more popular in contemporary fashion but their roots trace back to Ancient Egyptians and their multi strand colored clay beaded necklaces as well as the Victorian area and their multi strand pearls. Layered necklaces are great for adding excitement to a simple get up but still look great when complimenting more formal wear. Bead Necklaces: Beaded necklaces are great jewelry pieces to wear for any variety of occasions. These necklaces often include a single string of uniform beads complimented by one different bead, sometimes a gold nugget, and are usually connected in the back by an amber clasp. Most of our bead necklaces at Lauren B Jewelry are round shaped but the dimensions of the beads and overall length of the necklace may vary. We strive to provide you with a wide array of pleasing color options such as tiger eye, amethyst, lapis lazuli and rose quartz bead necklaces to name a few. If you do not see a bead style necklace to your liking on our website or in our New York City showroom, feel free to ask us to custom design one for you. Gold Link Necklaces: A gold chain necklace can still have enough personality to be worn on its own without any adornments. At Lauren B Jewelry, we offer many different types of gold chain necklaces from 14 to 18 karat in yellow, white or rose gold. Each necklace has its own look whether it be the different style links, the various finishes on the gold; all in assorted lengths. Pendant Necklaces: A pendant can add life to a plain gold chain. It comes in a wide range of shapes, materials, and sizes. 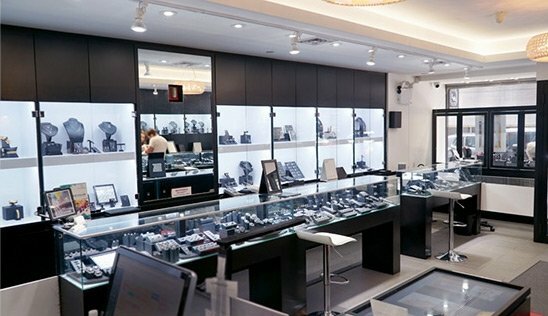 A solitaire diamond, a shaped piece of gold with gemstones , or a cut semi-precious stone are just a few of the most popular types of pendants we offer our clients. They make great gifts because they complement most any outfit for any occasion. Lauren B Jewelry has a full collection of pendant necklaces to choose from sure to.